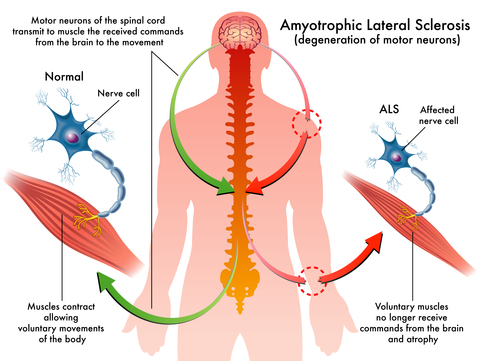 Amyotrophic lateral sclerosis (ALS), often referred to as “Lou Gehrig’s Disease,” named in honor of the famous baseball player who had it, is a progressive neurodegenerative disease. It affects nerve cells in the brain and the spinal cord through progressive degeneration of the body’s motor neurons, which reach from the brain to the spinal cord and then to all muscles throughout the body. With the degeneration of motor neurons, the ability of the brain to initiate and control muscle movement is lost. As voluntary muscle action is progressively affected, patients in the later stages of the disease may become totally paralyzed. A-myo-trophic comes from the Greek language. “A” means no or negative. “Myo” refers to muscle, and “Trophic” means nourishment –”no muscle nourishment.” When a muscle has no nourishment, it “atrophies” or wastes away. Lateral identifies the areas in a person’s spinal cord where portions of the nerve cells that signal and control the muscles are located. 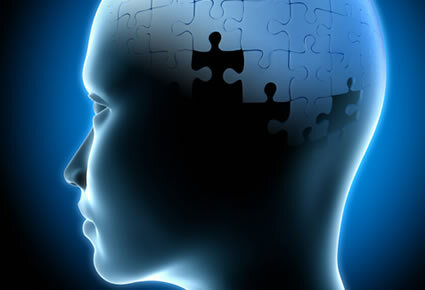 As this area degenerates it leads to scarring or hardening (sclerosis) in the region. The nerves that are affected by ALS are the ones that provide voluntary movements and muscle power. Examples of these movements include: making the effort to reach for the phone, stepping off a curb – these movements are controlled by the muscles in the arms and legs. The heart and the digestive system are also made of muscle, but their movements are not under voluntary control. When the heart beats or a meal is digested, it all happens automatically. Therefore, the heart and digestive system are not involved in ALS. Breathing, while involuntary, can eventually be impacted by this disease. Early symptoms of ALS often include increasing muscle weakness, especially involving the arms and legs, speech, swallowing or breathing. When muscles no longer receive the messages from the motor neurons that they require to function, the muscles begin to atrophy or be smaller. Limbs begin to look “thinner” as muscle tissue atrophies. The cause of ALS is not completely understood, yet recent years have brought a wealth of new scientific understanding regarding the physiology of this disease. While there is not currently a cure or treatment that halts or reverses ALS, there is one FDA approved drug, riluzole, which modestly slows the progression of the disease. Other drugs in clinical trials also hold promise. Importantly, there are significant devices and therapies that can manage the symptoms to help people maintain as much independence as possible and prolong survival. ALS is a variable disease; no two people will have the same journey or experiences. No matter the individual experience with ALS, the ALS Association is a good resource to turn to.